Postcard Creator is an excellent interactive tool from ReadWriteThink students can use to create awesome postcards to share with others. You can use it in writing activities with your students to engage them in literacy learning. 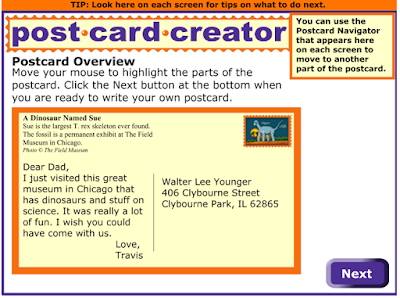 Besides learning about the different parts making a postcard, Postcard Creator provides students with a ready made template where they can fill in their information and generate beautiful postcards. The finished postcard can be printed and shared with others. To start using Postcard Creator, head over to this page and click on ‘Get Started’ and read through the tips provided there then click on ‘next’.Type in an example address, write the description of the scene or images that you will create for the front of the postcard. Next, type in the message for your postcard then select a stamp collection provided there. If you feel like you want to change something in your postcard, you can click on the ‘edit’ button and make your changes. When you are done click on ‘Print’.